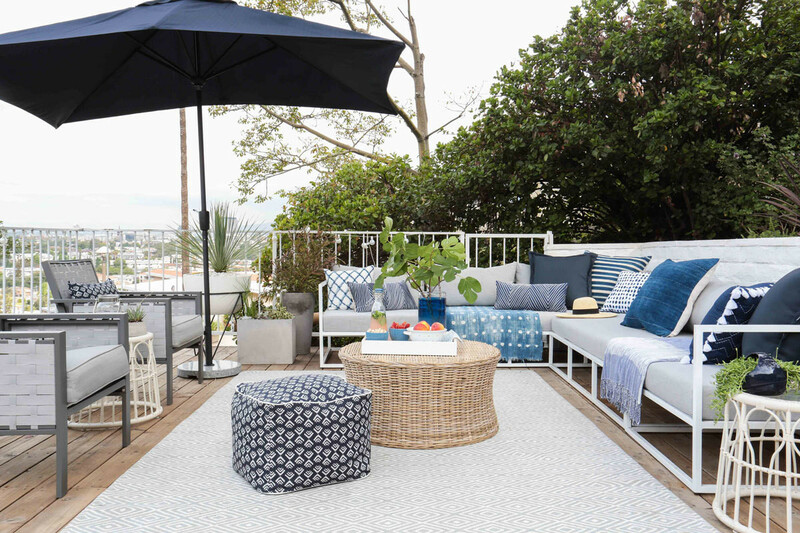 The living area of Emily Henderson's newly transformed deck, featuring an indoor-outdoor rug, pouf, umbrella, and patio chairs from Target's Threshold collection. For more product information, see slideshow below. 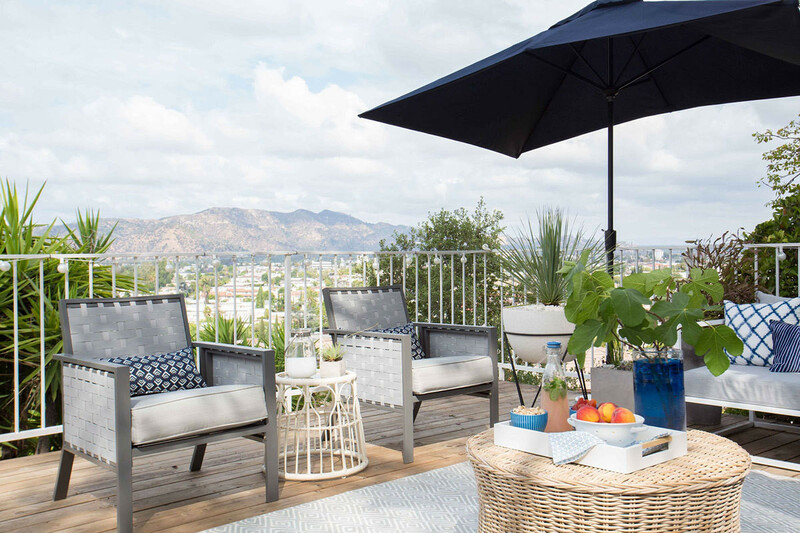 Ah, the joys of outdoor living—especially in Los Angeles, where this glorious patio makeover just went down at the home of one of our favorite design-industry pros. “I’d like to think of our new deck as a super-relaxing, low-maintenance escape,” says Emily Henderson. 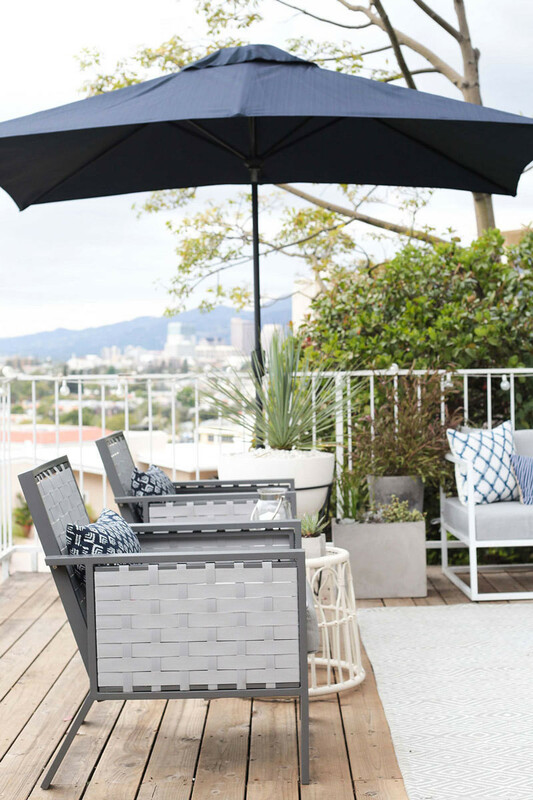 “It’s basically an extension of our living space—and since we live in California, luckily this is a place we can use all year round.” Filled with shoppable decor ideas and the smart use of color and materials, the transformation is quintessential Emily Henderson: enviable yet attainable. Here, a look at how she pulled off this at-home retreat. Henderson with her son, Charlie. 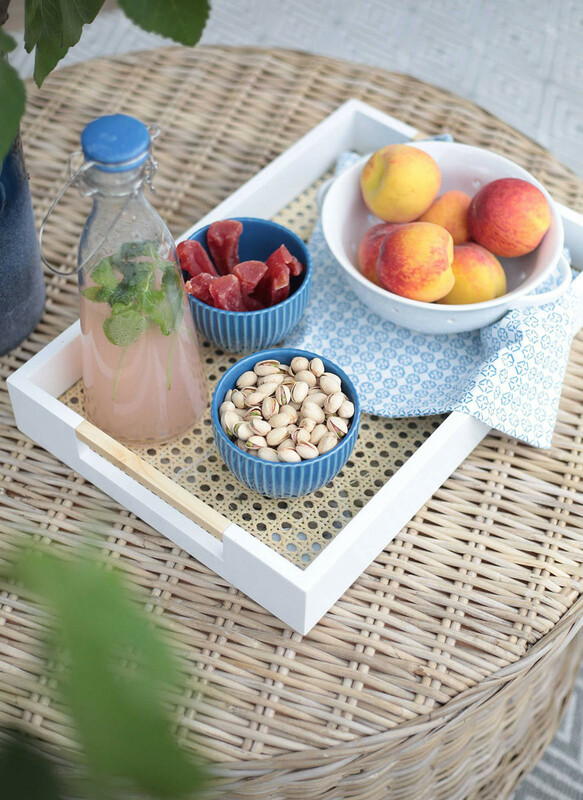 A cane-backed tray is a summer entertaining staple. 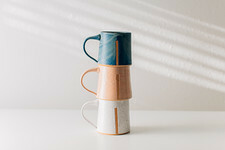 One of the reasons we at Lonny adore Emily Henderson (and clearly we’re not alone here) is her ability to make decorating a home seem down to earth and downright fun. The 1964 fixer-upper that she and husband Brian bought in Glendale, an area of L.A. that’s still relatively under the radar, is a case in point: readers are invited to follow along (and even vote!) at various steps along the way, from the brass-and-marble kitchen backsplash to the woodsy wonderland–inspired holiday trimmings. “When we first saw our house, we knew it needed a lot of work and TLC, but it had amazing potential. The view from the deck was a big selling point,” Henderson says. Pregnant at the time with her now-one-and-a-half-year-old son, Charlie, she saw the 600-square-foot expanse of outdoor space as a worthy substitute for the classic suburban backyard. Structural elements such as the railing and larger furniture pieces are framed in white for an airy feel that doesn't compete with the scenery. 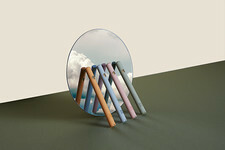 The philosophy behind the deck’s design couldn’t be more universal. “I wanted it to be fun, easy, and comfortable, with enough space for my kids to hang out and enough seating for my friends and me to lie around and talk all night,” Henderson explains. Expecting their second child (a girl) in the fall, she and Brian found their priorities firmly ensconced in the domestic sphere: having a spot for a morning coffee, a place to curl up with a good book, and a setting for summer barbecues. 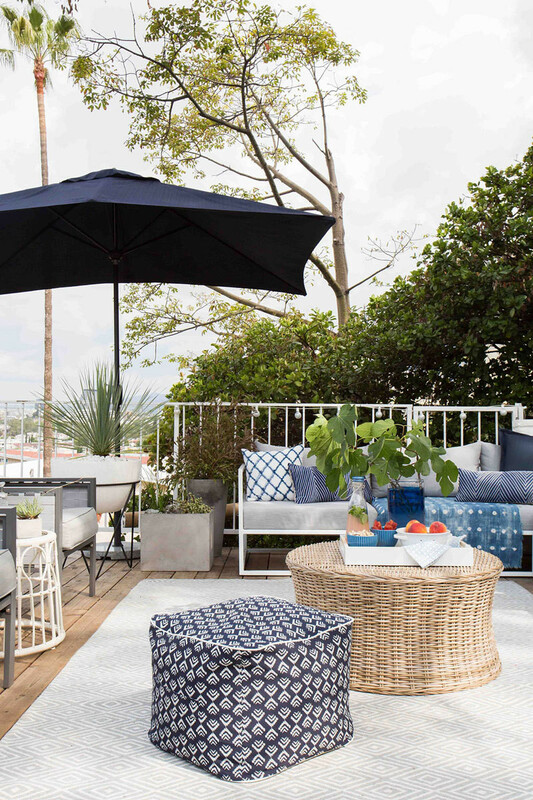 The outdoor palette—“shades of blue and gray, with neutral accents peppered throughout”—was a natural extension of the hues she gravitated to indoors. The metal railings and brick retaining walls were painted white; in combination with the lush undertones of green from the surrounding foliage, the overall vibe evokes a breezy, low-key West Coast sensibility. Poufs and ottomans can be moved around with little effort. Pillows throughout the space provide a cohesive color story. The deck is divided into two zones: a 20-by-16-foot living and dining area and a 10-by-20-foot play area for Charlie. 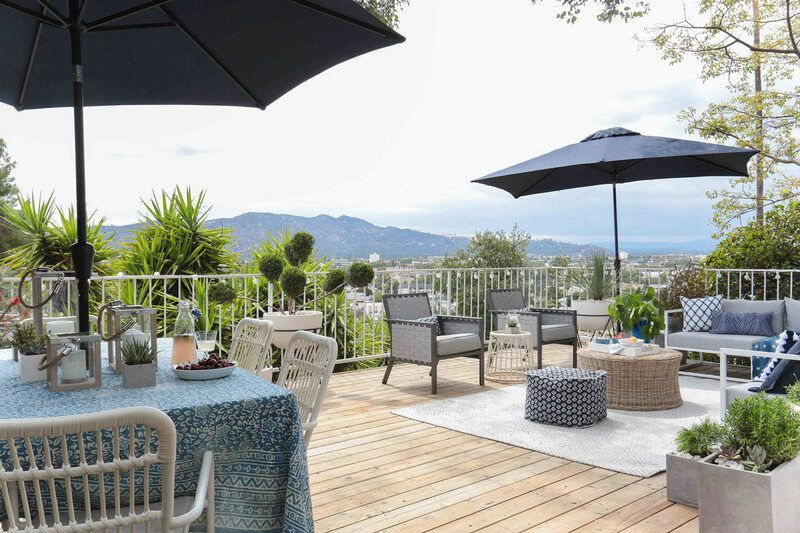 A gray-and-white outdoor rug with a subtle diamond pattern grounds the seating area opposite the dining table, with matching navy-shaded patio umbrellas on each side of the space to establish a sense of symmetry. (For product links, see the slideshow below.) A clean-lined sectional framed in white borders one corner, while lightweight, versatile furniture pieces—poufs, powder-coated patio chairs, a wicker ottoman—can be moved around as necessary. Layer containers at various heights for visual interest. Add playfulness with sculptural forms. “The whole space needed added intimacy and warmth because it’s so open,” Henderson says. 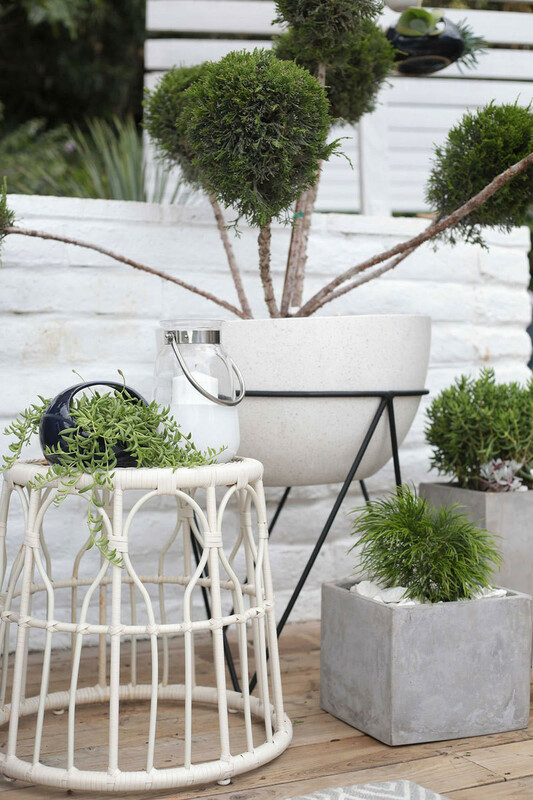 To create a sense of enclosure and extend the greenery from the hillside onto the deck itself, she brought in square concrete planters in varying sizes, circular vessels elevated on midcentury-inspired stands, and miniature containers that make for a casual tablescape. The sculptural, Mediterranean-style plantings echo the dominant color palette and contemporary mood. As with all things landscape-related, patience is of the essence. “While I like it [now], I think in a year I’m going to love it,” Henderson says. 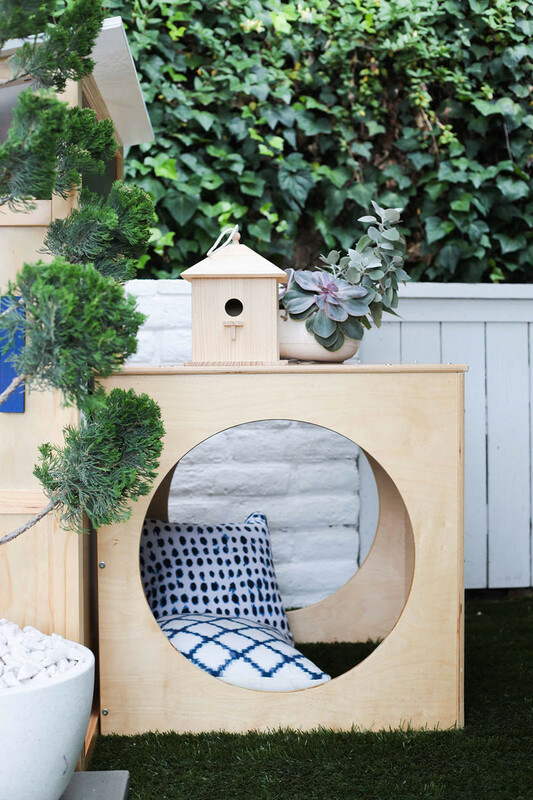 What Henderson calls the “dedicated Charlie area” is a space straight out of every toddler’s fantasy world: a little nook with a modernist playhouse, synthetic lawn, a wall of greenery, and a row of gray pavers that acts as a welcome path to the miniature front door. A pine birdhouse perches on the roof; an S-shaped chair in white supplies a seat next to the pillow-laden crawl space. “Charlie is giddy with excitement every time he goes over there,” says Henderson, who opened up the overhead trellis and painted it white for an airier mood. There's nothing overly complicated about this patio design—which makes it the ideal environment for outdoor living. After all, what’s a deck for if not to entertain? “An early-evening cookout with friends and family; plenty of grilling, laughs, and cocktails for everyone else,” is how Henderson describes her ideal gathering at this point in time. 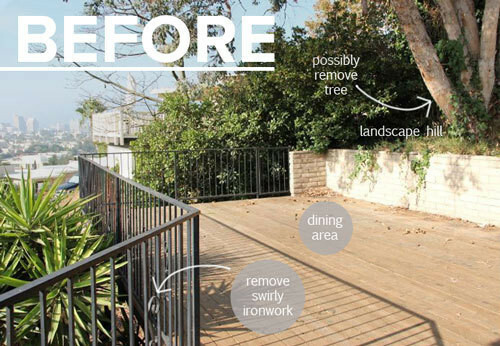 “Low-maintenance with a lot of gossiping and storytelling.” With this deck makeover, Henderson brings that vision to vivid life.